In his 1992 paper ‘Where Are the Missing Masses? The Sociology of a Few Mundane Artifacts’, Bruno Latour observed how sociology suffers from a theoretical deficit. Scholars have, in his view, overlooked something fundamental- the role of objects and artefacts in social life. The so-called “missing masses”, argued Latour, have always populated our immediate surroundings but remain absent from our canonical social theories. His proposal of Actor Network Theory, which granted agency to inanimate objects as “social actors”, has been deemed a “radical ontology” and met with much scepticism. But how radical is it, the proposition that the missing masses might speak to us in some way? Once we afford agency to the inanimate, perplexing questions abound. This is understandable. The legacy of the Enlightenment thrives within us all. Our conceptual schematics do not permit the blurring of boundaries between animate and inanimate, observer and artefact. It is not at all surprising, therefore, that when controversies like that of Hoa Hakananai’a’s exhibition occur they are deemed extraordinary, brought around by Others who hold irrational beliefs (Said 1978). But museums should not be treated as neutral sites, and subsequently it follows that they should not be overlooked in the sociological imagination. Having toiled for what seemed endlessly doing analytical work about a particular exhibition at the Science Museum for my undergraduate dissertation, I can testify- with some confidence at least- that the act of exhibition is always a political one (Gieryn 1998). This is because museums are physical sites of epistemic power. They are inherently imaginary yet spatially real. The exhibition, which has been meticulously pieced together by its numerous curators, acts in an astonishing variety of implicit ways to function as an ideal space ( or “heterotopia” (Foucault 1967)). More fascinating than the invisible architecture of these sites, however, is that these ideal spaces are constantly under threat. The knowledge monopolies accrued over history, realised through the exhibition of material artefacts, are fundamentally precarious. Glass display cases and the dispersed signage which permits touch cannot hold back the social world which exists outside of the gallery walls. As Hetherington (2012:82) observes, ““New ideas, new manifestations of culture and artefacts, new interpretations […] continually redraw what is seen as inside and what outside”. The museum creates objects of knowledge. It also creates spectacles which capture the visitors gaze. But this control is never absolute. Sometimes the missing masses, housed within the Museum’s walls and behind glass cases, surprise us all when they suddenly begin to speak. Hoa Hakananai’a speaks- and I have heard it for myself. After reading about Hoa in the mainstream press, I was interested to see whether some of my undergraduate hypotheses still stood. The visit did not disappoint. Hoa Hakananai is the archetypal “object of knowledge” par excellence. Activity around Hoa had grown prolifically since the coverage. Groups of spectators gathered with their tour guides. Bystanders stopped to capture a selfie. To my surprise, a member of the audience produced a fridge magnet they had purchased from the gift shop and asked a steward if they could take a photo of them. The steward nonchalantly agreed. The visitor then took a step back, as if to judge the angle, and a snap was taken for social media of them holding miniature Hoa in front of “the real deal” (creating, in that moment, the kind of meta-simulacrum which has proliferated exponentially under late capitalism (Baudrillard 1981). I decided to strike up a conversation with a nearby stewardess. The stewardess had been sent from her usual route to supervise the jostling crowds surrounding Hoa Hakananai’a. As we chatted, I asked her about the protestors and what was suddenly so special about the inanimate Hoa Hakananai. “The British Museum is moving into a new era”, she claimed, and “Hoa Hakananai’a is an object with multiple histories”. Hoa suddenly posed a fundamental challenge to the exhibit where it had been silently housed for the past 150 years (The Guardian 2018). This is because the indigenous protestors from Easter Island had brought with them “the outside” to a previously ideal space. They had disrupted the silence of the gallery with their protest and their tears. They permeated the unspoken boundary between spectator and object by ignoring the signage and leaving behind objects from a ritual to honour Hoa. When I posed this question of boundaries to the stewardess (“If they [the protestors] can touch Hoa, why can’t other visitors?”), she considered it for a moment before replying. “The gallery has to be a lot of things at the same time” she said “it can’t mean the same thing for everybody who visits”. She then proceeded to show me a sign which had been erected for the purposes of the gallery. 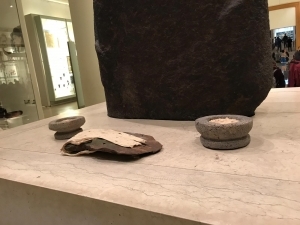 “This is the only sign like this you’ll see here [the British Museum] because we display photographs of indigenous peoples who are deceased and in their culture there are taboos around viewing images of the dead […] you see this in Australia a lot, for instance”. Such is the challenge of exhibiting, to quote the stewardess, “both dead and live cultures”. 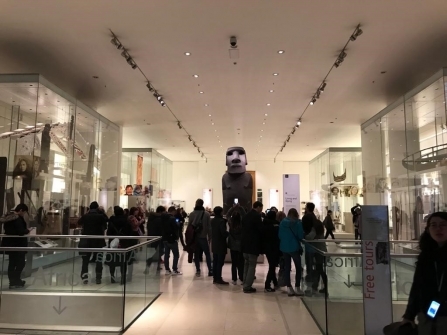 The British Museum’s monopoly over history had suddenly been disrupted when Hoa Hakananai’a – long presumed dead- was resurrected by protestors last week. Through a sociological lens, extraordinary cases like these reveal something compelling. The protestors claims to ownership and the physical permeation of the spectator/artefact boundary had done a lot to disrupt the heterotopic space which enclosed them both. Large crowds gathered where there would have previously been empty space and, in turn, extra stewards were dispatched to monitor them. But Hoa’s newfound voice did more than generate a few extra hours on the rota- it spoke to power. The Hoa Hakananai’a controversy has led curators to rethink the discursive architectures of the exhibit in which it is currently housed. Furthermore, the remnants of protest have radically disrupted the ordering of the space surrounding Hoa. The epistemic power which orders artefacts, and subsequently homogenises peoples (see Lineaus in Müller-Wille 2014), has come under threat. Questions of ownership and of rights, of history and the colonial past- these matters which were considered given and stable within the confines of a room exhibiting “dead” cultures have arisen to haunt the present with vigour. As I left the exhibit, I thought about Hoa Hakananai’a and wondered whether the protestors would be successful in their bid to take back Easter Island’s stolen property. On the face of it, the Hoa Hakananai’a controversy has seemingly served its purpose- it is a promising project with mainstream coverage. 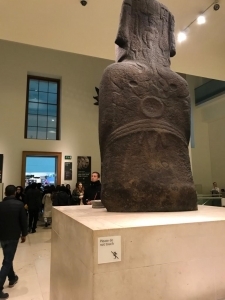 Online news articles showcase infographic videos about the unjust obtainment of the artefact, along with emotive clips of Tarita Alarcón Rapu (the governor of Easter Island) crying in the famous lobby of the British Museum. But there is something more to this controversy than that which initially appears on the surface. Hoa’s voice should speak to those of us with sociological imaginations. What we should see in Hoa Hakananai’a is a deficit in theory. When we readjust our analytical lens to power, infinite possibilities for both theory and praxis are revealed. Instead of overlooking the Museum and it’s controversies as the inevitable by-product of an increasingly contentious, globalised world, I argue that there should be a renewed interest in critical scholarship of Museums. There is simply not enough sociology about these extraordinary microcosms where knowledge and power become spatially and temporally realised. Museum sociology, which falls under the branch of “Cultural Theory/Studies”, hasn’t seen much renewed scholarship of recent years. But perhaps it should, especially when debates about truth, post-truth and postmodernism are seemingly intensifying (see Daniel Dennett (1998), and Jordan Peterson (2017)). 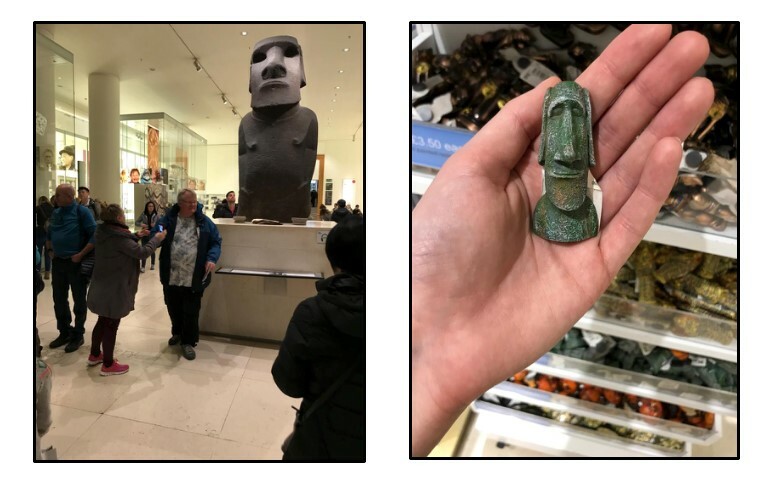 When I questioned Professor Tony Bennett (2018:n.p) about this at an LSE public lecture, he maintained that “The post-truth zeitgeist […] has not yet affected museums. The respect for museums remains intact”. Yet I argue that if we nevertheless extend our ears, pause for a moment with questions of identity politics, posthumanism and Donald Trump- and actually “listen to the silences of history” (Foucault 1961), we might hear the chorus of the inanimate missing masses who are so often overlooked but are as equally desperate to be heard. If you are a sociologist interested in questions of knowledge and power, I urge you to visit Hoa Hakananai’a at the British Museum. It’s “free” (you don’t need to purchase a ticket, at least!). Observe for yourself what is happening in this heterotopic space- then consider the possibilities if we actively challenged these epistemic injustices where they arise. These sites are worthy of study and a renewed critical interest, even if they fall outside the comfortable parameters of mainstream campaigns such as ‘decolonise the curriculum’. 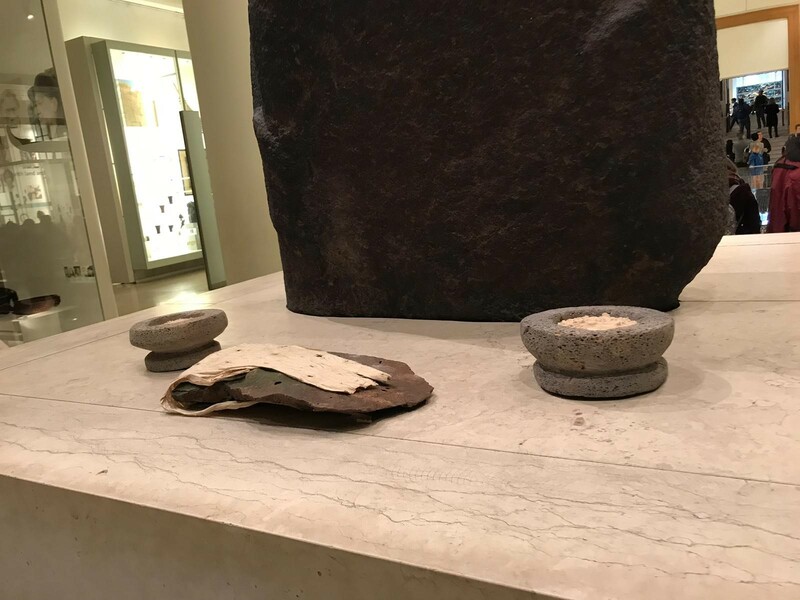 The Hoa Hakananai’a controversy has proved to be such a popular news story because it raises those difficult and emotive questions that visitors nor curators cannot easily answer. Hoa’s newfound voice directly speaks to power. It throws a spanner into the works of the exhibition, the latter being a “meaning machine […] [a] map of power, an arrested moment of social relations that in turn threaten to govern the living” (Haraway 1988:52). I therefore urge you to visit the exhibit and witness this phenomenon for yourselves. The growing opposition to these heterotopic sites is a testament to their understated (and overlooked) powers (see Savoy and Sarr 2018). Only time will tell if the perceived public respect for museums will remain intact (Bennett 2018) – and it will be fascinating for any sociologist concerned with questions of power to see how Museums respond to this foreboding threat to their oligopolies over knowledge. Sociologists of the Museum, unite! You have nothing to lose but your chains. ABC (2018) “Easter Island delegation wants return of Hoa Hakananai’a sculpture taken in 1868 as gift for Queen Victoria”, ABC News [Online]. Available at https://www.abc.net.au/news/2018-11-21/easter-island-delegation-requests-return-of-iconic-sculpture/10518028 (Accessed 23rd November 2018). 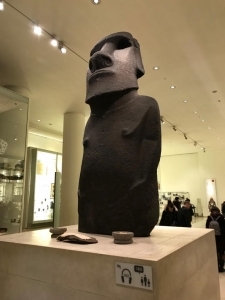 Agence, F-P., (2018) “Easter Island governor begs British Museum to return Moai: ‘You have our soul’”, The Guardian [Online]. 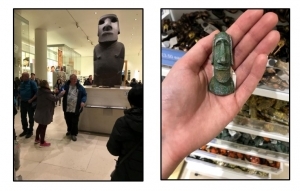 Available at https://www.theguardian.com/world/2018/nov/20/easter-island-british-museum-return-moai-statue (Accessed 23rd November 2018). Baudrillard, J & Poster, M (2001) Jean Baudrillard: Selected Writings Cambridge: Polity Press. Brenkert, G., (1979) ‘Freedom and Private Property in Marx’, Philosophy & Public Affairs 8(2): 122-147. Carney, P, J S., (2012) “”The Precession of Simulacra” by Jean Baudrillard, Translated from English into American” ContinentContinent [Online]. Available at http://www.continentcontinent.cc/index.php/continent/article/viewArticle/91 (Accessed 23rd November 2018). Dennett, D (1998) ‘Postmodernism and truth’, World Congress of Philosophy [online] (delivered 13th of August, 1998). Available at https://ase.tufts.edu/cogstud/dennett/papers/postmod.tru.htm (Accessed 23rd November 2018). Foucault, M (2001) Madness and Civilization: A History of Insanity in the Age of Reason Oxford: Routledge [first published Paris: Librairie Plon 1961]. Foucault, M & Miskowiec, J (1984) ‘Of Other Spaces: Utopias and Heteropias’, Architecture/Mouvement/Continuite [first published “Des Espace Autres”, March 1967]. France24, (2018) “Report calls for France to return art taken during colonialism to Africa”, France24 [Online]. Available at https://www.france24.com/en/20181123-france-return-african-art-benin-macron-quai-branly-colonial-british-museum (Accessed 23rd November 2018). Gieryn, F T (1998) ‘Balancing Acts: Science, Enola Gay and History Wars at the Smithsonian’, in The Politics of Display: 198-228. Haraway, D.(1985) ‘Teddy Bear Patriarchy: Taxidermy in the Garden of Eden, New York City. 1908-1936’, Social Text 11:20-64. Hetherington, K (2012), ‘Museums and the ‘Death of Experience’ singularity, interiority and the outside’, International Journal of Heritage Studies 20(1): 72-85. Latour, B. (1992) Where are the missing masses? : The sociology of a few mundane artefacts. In: Bijker, W. E. & Law, J. (eds.) Shaping technology/building society: Studies in Sociotechnical change. Cambridge, MA: MIT Press. Peterson, B. J., (2017) “Jordan Peterson – Foucault The Reprehensible & Derrida The Trickster” [Youtube]. 11th December. Available at https://www.youtube.com/watch?v=NBFSDd_5tiE (Accessed: 23rd November 2018). Said, W. E (1978). Orientalism. New York, Pantheon Books. Staffan, W-M., (2014), ‘Race and History: Comments from an Epistemological Point of View’, Science, Technology, & Human Values 39(4):597-606. Lucy Smith is on the MSc Sociology programme at LSE. The images are her own. Twitter: @LucyRebecca95.